Are you looking for a charming countryside villa look further than Villa Elianna! This beautifully furnished and spacious 4 bedroom, 3 bathroom property is a hidden gem. 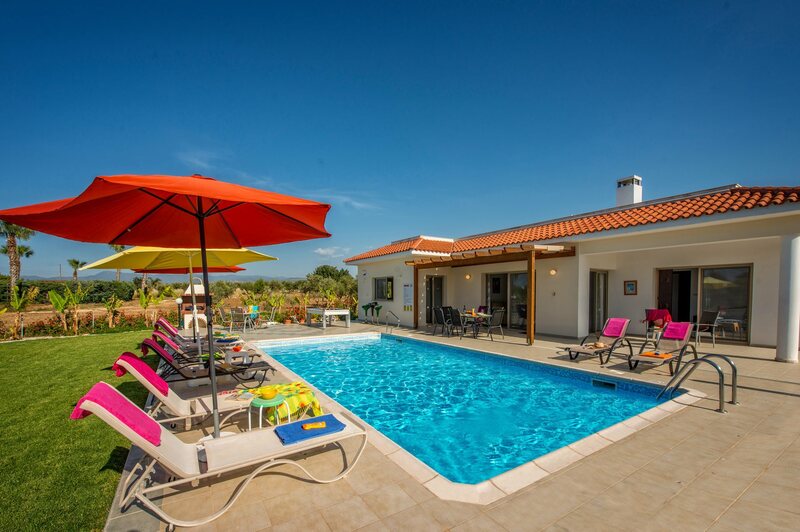 Located a short drive away from the authentic Cypriot village of Polis and picturesque harbour of Latchi it's a great base to explore, as well as have a relaxing holiday by your own private pool. Air conditioning/heating in bedrooms, pool heating and WiFi are included. A relaxing escape in the Cypriot countryside, just a short drive from Latchi harbour and beach! The private pool is surrounded by a spacious terrace with a lawned area which is great for children to play on. The brick-built BBQ is on one side of the pool, an ideal way to dine alfresco during your villa holiday whilst you make the most of the countryside views. The main entrance is located at the rear of the property. The parking is at the side of the villa. The front door leads into the spacious, light and airy, open plan living area . The lounge has comfortable seating and a flat screen TV, with patio doors leading out to the private pool and terrace. The kitchen has contemporary style units and all the mod cons including an American style fridge/freezer. There is also a table and chairs here. All of the living accommodation is spread over one floor. The 2 double bedrooms, both have patio doors with direct access to the pool terrace. One double bedroom has an en suite bathroom. There are also 2 twin bedrooms, one with an en suite shower room as well as a separate bathroom. This 4 bedroom villa is ideally located in the Latchi countryside with the beautiful harbour, shops, restaurants and beach a short drive away from the villa. The authentic town of Polis with its pleasant beach is also short drive away from this property . Villa Joelena is the next villa up, located on the same road. Paphos Old Town, with its narrow streets and covered market, is well worth a visit and has an abundance of clothes shops and high street stores to suit everyone's needs. It's a great place for souvenirs reminding you of your holiday in Cyprus! Latchi is famous for its quality fresh fish and seafood restaurants. At the end of the beach is the beautiful harbour where the old stone carob warehouses have been converted into restaurants where you can sit and watch the old fishing boats . A few miles East of Latchi lies the town of Polis which has a pedestrianised village centre, where there are a handful of traditional tavernas and restaurants. This pleasant single-storey villa is just a short drive from the stunning beaches of Latchi and Polis. Latchi Beach is great for snorkelling in the crystal blue waters. This is mainly a pebble beach. The popular beach of Coral Bay is less than 1 hour drive away. In Polis, there is go-karting to try and parks where you can enjoy a picnic. Paphos Zoo is great for a day out and one of the four most popular water parks on the island is the Aphrodite Water Park in Paphos. It has a special areas and rides for smaller children such as slides, fountains, water guns, and even a slippery octopus to climb. For the bigger children or brave and adventurous adults there are whirlpools, kamikaze slides, wave pools and water chutes plunging down into the darkness! Latchi village is situated in the foothills of the Akamas National Park on the North West coast of Cyprus. You can hire boats from the harbour to explore the coastline of the Akamas which is steeped in history and famous for its white sandy beach coves and the Blue Lagoon. Along the coastline which takes you to the Akamas Peninsular lies the Bath of Aphrodite where the goddess used to bathe. The park itself is famous for its 500 plus plant species and wide variety of birds, mammals and butterflies. There are 3, well established golf courses found in Western Cyprus . Neo Chorio is close by to Latchi - this is a tiny, very traditional Cypriot village. Sitting right on the tip of the coast, Neo Chorio has stunning views and is the place to get away from it all. Villa Elianna is not available to book for season as it is sold out. Take a look here at the Cyprus villas that are currently on sale. Located in Paphos harbour this unique submarine shaped 7D cinema is only cinema on the water. Great fun for all the family. Simply pick one of seven different kind of movies, then sit back and feel all 7D effects The combination of 3D movies with chair movement (vibration, sway, tilt, drop, wave motion, or movement in any direction) other effects, such as wind blowing, water spraying, leg and back ticklers, make a great 7D experience. Formerly Paphos Bird and Animal Park, has expanded the zoo and have lots more animals now within its confine. There are tigers, giraffes, tortoise and lots of other beautiful animals to see. There are also bird shows several times and day and are great fun for all the family. There is an adoption scheme which would make an unusual and great gift to take back from your holidays. A free bus is provided by the Zoo from Coral Bay and Latchi. George’s ranch is located in the picturesque area of Sea Caves. The fully equipped stable yard has 30 stables and 14 paddocks, large practise arena, Tack Room and Shower Room for the horses. The experienced staff are always on hand to provide training or advice on horse management. Trekking around the area of sea caves is an ideal way to see the stunning scenery. Beautiful, clean, spacious, well equipped, quiet villa! Fantastic week. A beautiful villa. I cannot pick a single fault with the villa and I have stayed in a few. Spotless throughout and not cheaply done either. Memory foam bed and powerful showers. Ice and drinks dispenser works and is a treat. Very private. Owners very pleasant. Would like to return at a later date. Thanks for a wonderful vacation!